It is not everyday a new Bentley is announced. It is a bit special. Known as Project Victoria the new Bentley will be the latest sibling to join the ever growing Continental family of Bentley motor cars. Based on the Continental GT, what is special about this Bentley is that it is simply the fastest, most powerful production Bentley ever. And just as the Queen is doing to her Bentley's, this new car can run on Biofuels. Visually the car has distinct front bumper bars with different placements of vents. Also the new car sports bonnet vents. 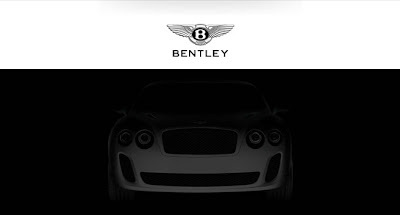 "On March 3rd at the 2009 International Geneva Motor Show, Bentley will reveal its fastest, most powerful production car ever. Delivering supercar performance, this new model is very much the extreme Bentley. Importantly, it will be capable of running on biofuel, delivering on a key component of Bentley's environmental commitment and pioneering the use of this fuel in the luxury sector." Here is the 'teaser' video of the new car. To read more about Bentley's environmental strategy take a read of this paper 'Bentley and the Future of Biofuels'. The paper does mention the palm oil issue in Malaysia and Indonesia. This is very much stepping stone technology. I'm more sold by hydrogen fuel cells. But at least they are doing something.